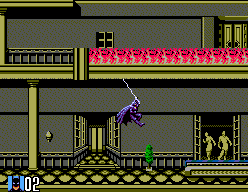 Batman Returns is an action-platformer that was originally released on the Sega Game Gear in 1992. There's five stages and your job is to protect Gotham City against The Penguin and his creatures. Button 1 allows you to attack with Batarangs (their speed and power can be upgraded), while Button 2 fires a Grappling Hook so you can grab onto ledges and swing between platforms. The level design shines and constantly throws new gameplay elements, hazards and enemies into the mix to keep things interesting. It is a tough game, but there's a nice element of progression where the obstacle additions force you to learn how to be more proficient. I love that there's a variety of ways to navigate each level, as you can explore by swinging around to find hidden secrets; the latter gives the action a grander feel and cleverly masks the otherwise linear stage design. The swing mechanic can be tricky to master, but once you do it's awesome and wouldn't feel out-of-place in a Spider-Man game! The controls aren't quite perfect though and the inability to turn around in mid-air causes problems in later levels, particularly when a water stream is pushing you along and you can't adjust the direction of your jump. A great feature is the ability to select between an Easy or Hard route prior to the first four stages; this gives skilled players more of a challenge and adds to the replayability. While these tougher stages are enjoyable, they do rely a little too heavy on leaps of faith with the swing mechanic. It is neat that some sections require you to fly carefully downwards though to avoid hazards, as it's a mechanic that's rarely used in Easy mode. The outstanding music is reminiscent of Streets of Rage 2 (1994, Master System) - it's no surprise that Yuzo Koshiro was involved in both - and the phenomenal graphics feature smooth animation. While Nintendo's 8-bit Batman game deserves the accolades it receives from the retro community, it's a shame this Master System version isn't talked about more often, as the grappling mechanic is just as fun as wall jumping. It's an excellent action-platformer that's worthy of multiple play-throughs thanks to its expertly crafted level design. Random trivia: This port omits the opening cut-scenes found in the Sega Game Gear original.